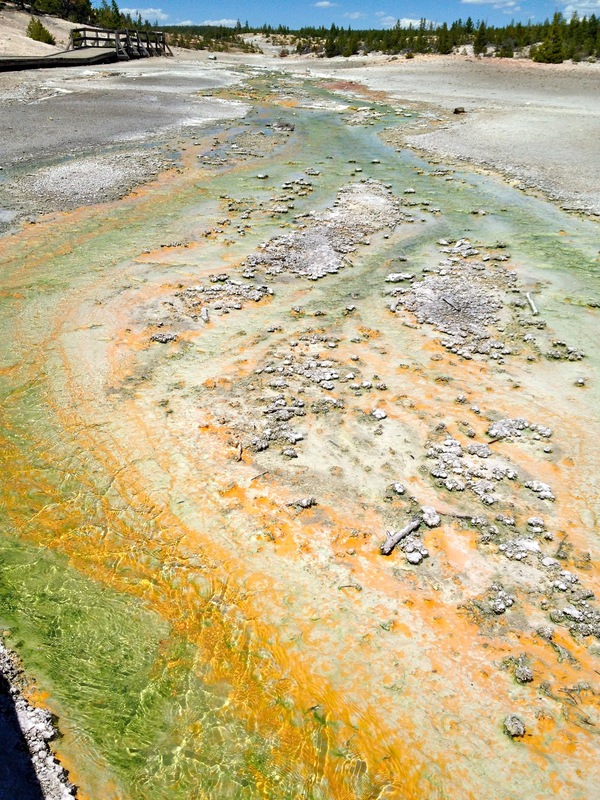 Morning at Mammoth Hot Springs, afternoon at the Norris Geyser Basin…only in Yellowstone National Park is something like this possible. I truly felt like I was visiting another planet. How else would you describe the scene below? We walked all around the area, for a total of 2 and a quarter miles. It was a fairly easy walk, much less stairs than Mammoth Hot Springs. I would walk the whole area if I were you, but I did hear a man look out over the above scene and tell his wife,”Come on, lets go. You’ve seen one geyser, you’ve seen them all!” I have to disagree with him. I was really glad we walked around the entire area. If you have kids, stop off at the restrooms in the parking lot BEFORE you head out. That is the only restroom and also the only place to get a drink. There are no water fountains or anything except for by the restrooms where you can purchase drinks. The Porcelain Basin area had some of those awesomely placed boardwalks. Look at these pictures below. I mean, you get to walk right through it! Can you see the boardwalk down there with the tiny people walking on it? Several of those pools were bubbling and squirting stuff. I took a video so you could see it in action. 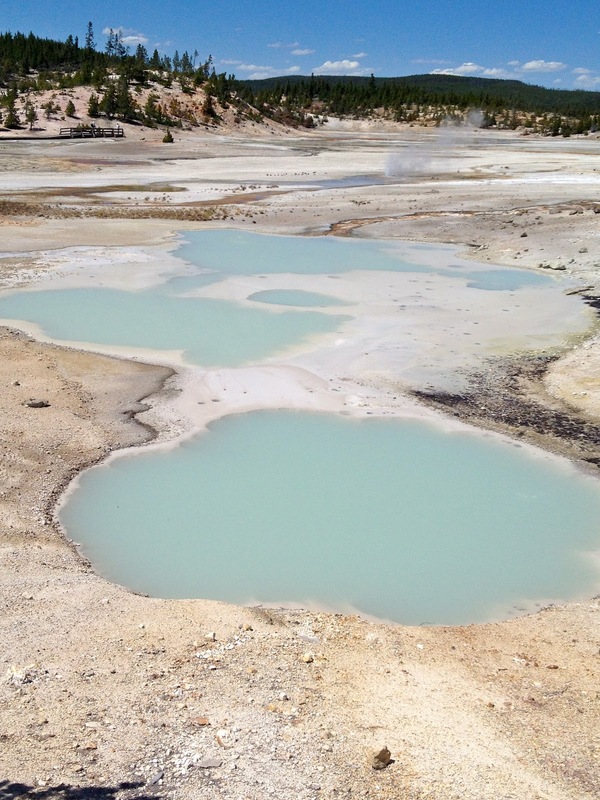 As we walked around Porcelain Basin we saw several different types of springs and geysers, all of them unique and interesting. After making it around the Porcelain Basin, we headed over to explore the Back Basin. I would start with the Back Basin if I were you. Otherwise, it might not be as interesting. Also, if you only have time for one, I would do the Porcelain Basin. They are both great, but it has more bang for a shorter distance. 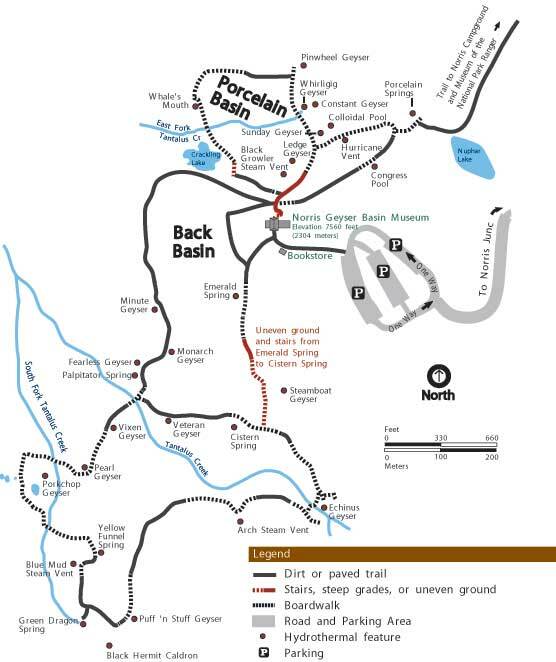 Below are some of the highlights from the Back Basin area. Thought this was funny…his shirt says, “Can I get a Hot Tub?” (from those State Farm commercials). There is no hotter tub than the one behind him! This one is called the Fearless Geyser. What an amazing two mile walk this was. So many unique things in such a short distance. 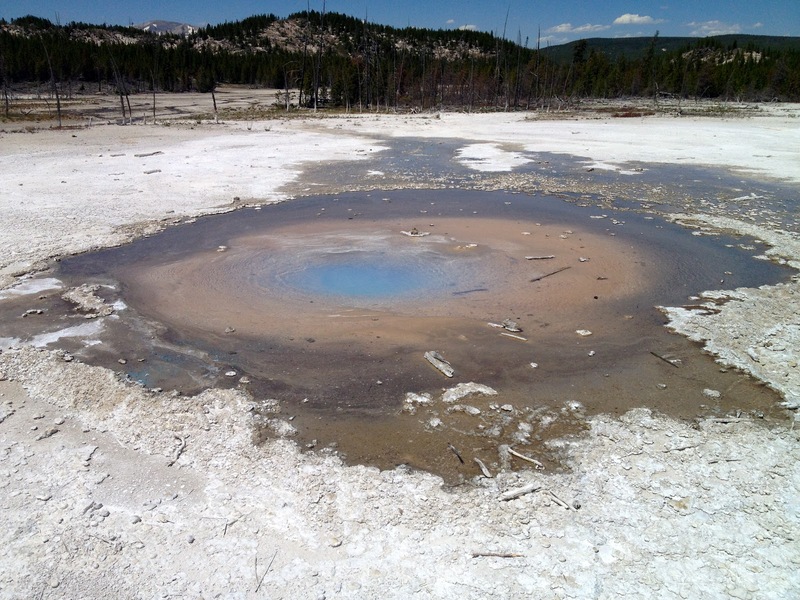 What was your favorite geological feature: Puff and Stuff Geyser, Crackling Lake or the Porcelain Springs area? I love a good geyser! We visited the famous one in Iceland: I could have sat for hours just watching it bubble up and blow every few minutes. I would love to visit Iceland. 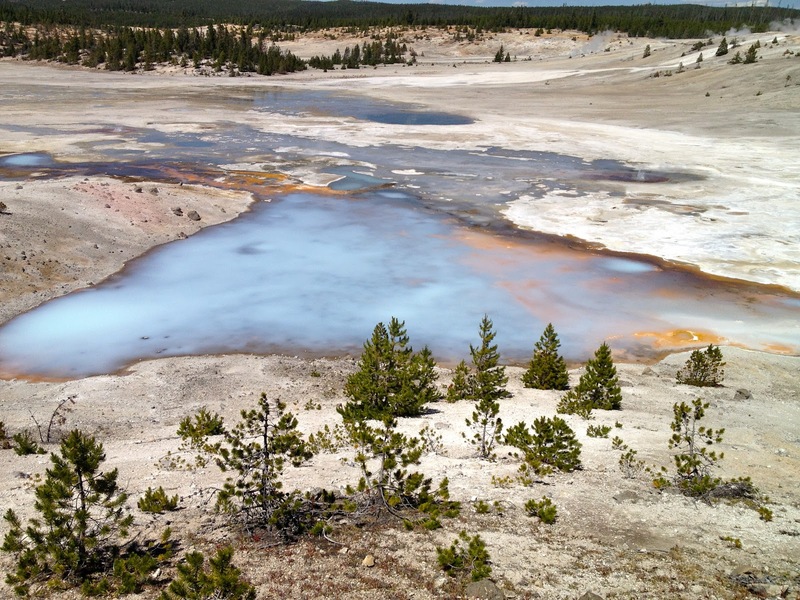 Does that geyser have the same sulfur smell that the Yellowstone ones do? I've never been, but it's on our short list for the next year or two. Very eery landscape. Thanks for the pointers! What a fun place to explore, I love all the strange colors coming out from these pools…wouldn't it be nice to somehow use the water for a big outdoor spa! I love Yellowstone – I wish I could vist there every year. But, since I haven't been there for awhile, your pictures make a good substitute. Thanks! Hope you get there soon! My second trip to Yellowstone and Mammoth Hot Springs today. Amazing photographs, Sonja! This is such a beautiful place, so much to see. Thanks! Such beautiful things to photograph here! We've never been there and I kick myself every time I see photos like yours. We will get there one of these days. Great photos! Thanks! Great place to visit…hope you get there soon! I loved these photos. I find it's really hard to capture the different colour variance left by minerals… but you've done a great job.